Revolax Fine with Lidocaine smooths away fine lines and wrinkles, refreshing aged and tired skin. Made of purified, highly cross-linked hyaluronic acid formulated with a soft and very smooth, particulate-free consistency, this implantable gel incorporates harmoniously with surrounding tissue for natural-looking results. Doctors sometimes use it in delicate areas like the tear troughs and neck. Revolax Fine with Lidocaine eliminates the early signs of aging on the face, such as superficial lines and wrinkles, that appear as a result of time and gravity. This dermal filler is formulated with highly cross-linked hyaluronic acid, conferring longevity of effects, yet has a lightweight feel—perfect for delicate areas with thin skin requiring superficial injections, like the forehead, neck, and under-eye area. The monophasic nature of the gel ensures that results appear natural and real while lowering the risk of undesired effects like swelling. The inclusion of lidocaine reduces treatment pain. 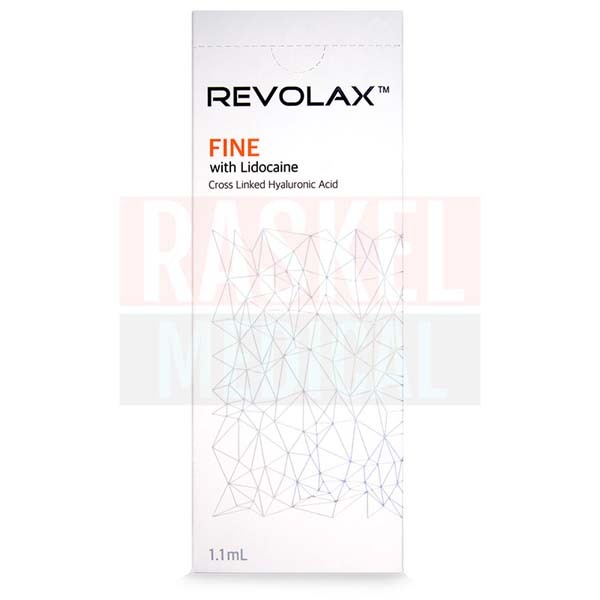 Revolax Fine with Lidocaine is made by Across Corporation, a pharmaceutical company based in South Korea. 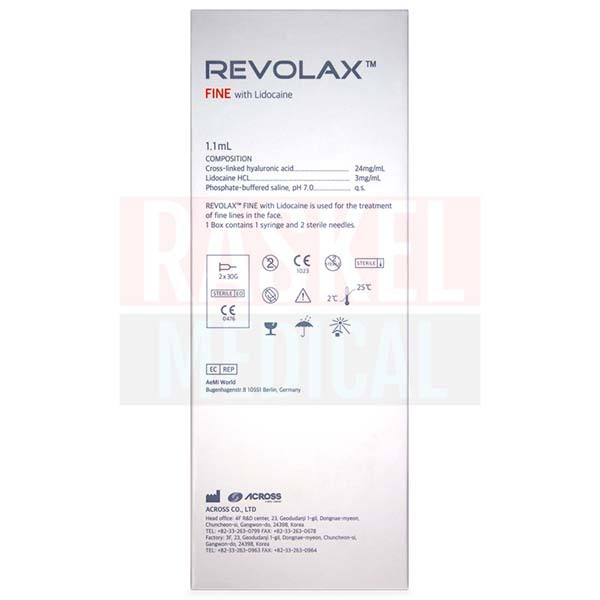 Revolax Fine with Lidocaine comes from South Korea. Side effects are generally minimal and related to the injection procedure. Immediately after the injection, patients may experience bruising, redness, tenderness, pain or swelling at the treated site. These symptoms are usually mild in severity and should resolve spontaneously within a week. More serious, but very rare, complications that have been reported with dermal filler use include vascular compromise leading to blindness, stroke or tissue necrosis; formation of nodules; and allergic reactions. These complications require emergency medical intervention. Do not inject into areas of skin with active inflammation or infection, or into patients who have recently received abrasive dermal therapies (e.g. dermabrasion, chemical peeling, laser therapy). Revolax Fine with Lidocaine is not recommended for certain groups of patients. These include individuals under 18 years of age, women who are pregnant or lactating, patients with a known history of allergy to hyaluronic acid or lidocaine, and patients prone to hypertrophic scarring. Revolax Fine with Lidocaine can be used on all skin types, as the material is non-immunogenic and well-tolerated. The hyaluronic acid used in Revolax products is of non-animal origin, thus allergy testing is not necessary. The Revolax line of dermal fillers also include Revolax Deep with Lidocaine, a versatile filler used for the treatment of moderate wrinkles and for enhancement of the cheeks, chin and lips, and Revolax Sub-Q with Lidocaine, for volumizing and treating severe and deep wrinkles and folds. Revolax Fine with Lidocaine is administered via intradermal injection, a procedure that should be carried out by a licensed and trained medical doctor. The treatment plan begins with a consultation in which the patient outlines their concerns and the procedure is discussed. Potential injection sites are marked out with a marking pen, and the need for additional pain management measures is assessed. Before the dermal injection, ensure that the treated area is cleansed and sanitized with antiseptic to avoid contamination. 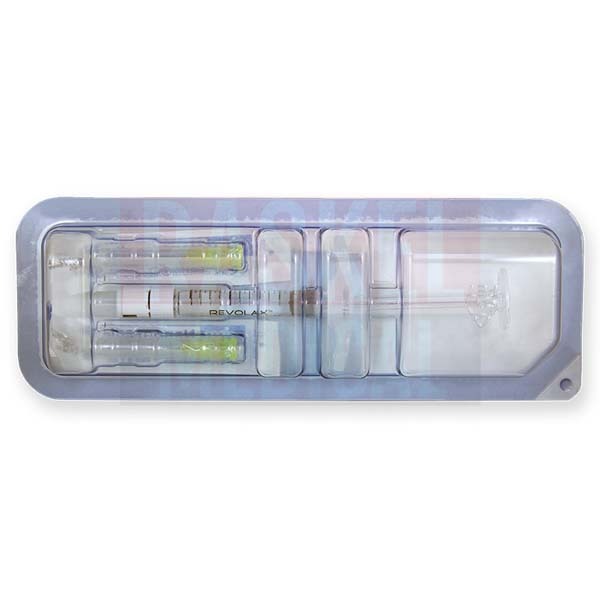 Inject Revolax Fine with Lidocaine with a 30G needle, using steady pressure and in a slow manner. Use the injection technique appropriate to the situation. Do not overcorrect. Once the injection is completed, lightly massage the treated area to ensure uniform distribution. 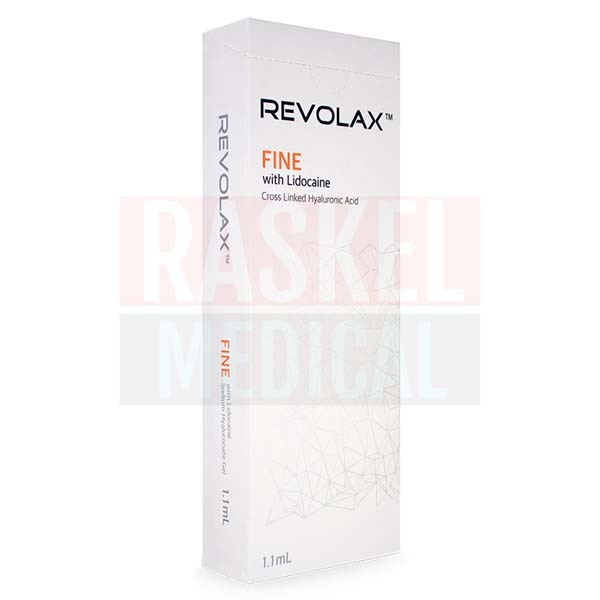 Revolax Fine with Lidocaine is a clear, colorless, viscoelastic gel made of highly purified, 100% cross-linked hyaluronic acid derived from the bacteria Streptococcus zooepidemicus, in a concentration of 24mg/ml and 0.3% Lidocaine hydrochloride. It has a complex viscosity of 80 MPa, the lowest of the fillers in the Revolax range. Revolax is manufactured using a unique manufacturing process which results in a homogenous, uniform gel that is monophasic in nature. The gel contains no free hyaluronic acid, making the injection process easier to perform and prolongs the duration of effects. Revolax Fine with Lidocaine is a lightweight filler produces results that last 12 to 18 months. That being said, it is important to note that the duration of results can vary by patient and depends on some factors which include volume of filler used, region that was treated, and intrinsic factors like skin type and condition. As the effects of treatment are not permanent, repeat treatments are necessary in order to sustain the benefits. Store Revolax Fine with Lidocaine at 2–25°C. Keep this facial filler out of light. This product expires after 24 months from the date of manufacture. Do not use past its expiration date.